I made this bag almost a year ago, but thought I would share this one too. 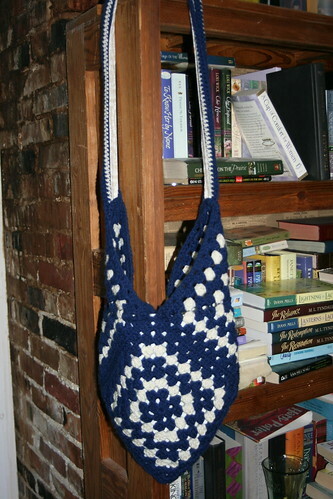 It's another granny square bag, similar to the Get Your Granny On. Gauge is not important, I think I probably used an H hook or an I hook. You can find granny square patterns all over the net, in many different versions, this is just the original granny square. This is just a rough explanation of what I did. Hopefully the picture will help you along a little. I made 4 squares doing 8 rounds each. This is just a matter of preference, make larger or smaller by adjusting your rounds to what you like. I used two for the bottom standing on a corner and attach by either whip stitch or if you prefer single crochet to hold together. Start from one corner down one side and up the second. Then take another square for either side of bag and attach by floding in half by matching two corners together and fitting down the sides of the two bottom squares on each side. For a strap I just made a chain for whatever length, then hdc around adding a few stitches to the corners to make them rounded and then hdc along the back side of chain, and then sc around for round 2. I made mine long enough to be able to go from one shoulder and hang accross my opposite side. Being sure to remember that if you don't line the strap it will have to give to it and stretch some. I attached mine to the corner of the side squares. I did make a lining for this to keep all the little things in place. Please message me if you have any questions. I am just remembering this from the bag I gave away. Awesome! It's so simple yet so pretty. I know everyone is going to want one. Well, they're at least getting one from me for Christmas! Thanks you for sharing! :o) You are very welcome! thank you for sharing. very nice! Thanks so very much for sharing this pattern it makes a lovely gift and the perfect purse for my grandaughter. I also made one for her doll lol. Matching purses.. I can´t hear about diamond word even if you mean anything else. But the true is that i would like to have bracelet, rings and necklace with diamond everywhere. This gemstone shouldn´t be sold too expensive. that is why i prefer to buy viagra for my husband at a good price and the result is wonderful.